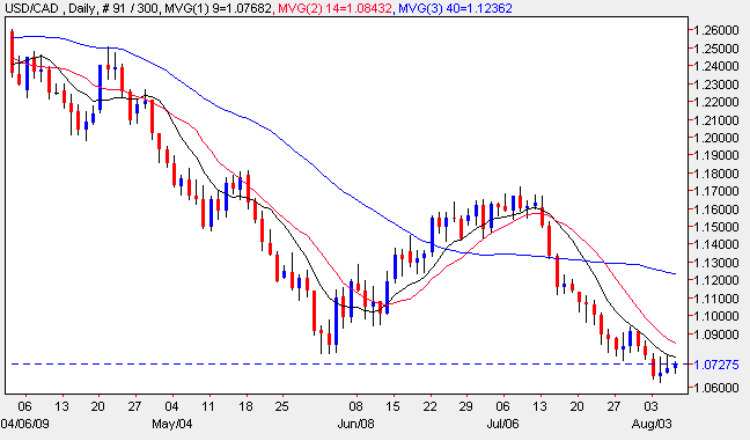 An interesting day for the dollar to cad currency pair on the daily chart yesterday as, once again, an effort to rise by the US Dollar was promptly squashed by the Loonie Bulls. The trading session ended the day with prices marginally higher but with a deep upper wick to the body of the candle, very similar to that of Tuesday. What is particularly worrying for the US Dollar bulls in this pair is that on both occasions the 9 day moving average provided an impenetrable barrier to any move higher which suggests that this is merely a staging post towards parity once again. With all three moving averages now pressing heavily on the pair it now only seems a matter of time before we see the trapdoor open once again, and any short reversal higher should be seen as an opportunity to sell the US Dollar once again. The main item of fundamental news on the economic calendar for Canada today is the Building Permits Data which is expected to come in at awful -1.2% when considered against last month’s figure of +14.8%. The Data measures the change in the total value of new building permits issued, but the figures could be distorted by the summer lull. Meanwhile in the US the market waits for the weekly unemployment claims before the main event, tomorrow’s Non Farm Payroll.